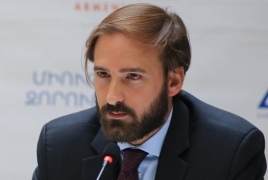 In a conversation with PanARMENIAN.Net, Lenzi offered details about the organizational process and the project in general, the results it yielded and the steps necessary for building a society more interested in arts. “We decided to enter the art and cultural scene because we realized that there is a infrastructural gap in Armenia when it comes to international exhibitions and events within this segment,” Lenzi said. The authors of the initiative now want to turn the major art exhibition into a foundation. Setting their minds on implementing the ICAE in the future too, they are planning to have the exhibition in Armenia every two years and in every other year replicate the concept in other countries, especially those with strong Armenian communities. As a first step, the founders decided to use cultural diplomacy to enhance and support economic growth in Armenia. The concept of Business in Art, for instance, which included the two conferences they arranged in the framework of the exhibition sought to build on these efforts. Also, ICAE2018 was to help boost tourism in Armenia, a country with so many places to see and so many things to experience, Lenzi believes. “Completely new economies, such as Singapore or Dubai, have created their respective artistic environment and have managed to achieve success without such a strong cultural base and history, whereas Armenia has a very strong base, given the rich and diverse cultural heritage,” he said. Determined to offer the very best to both the viewers looking forward to the exhibition and the artists getting into uncharted waters, the organizers involved professionals and a curatorial team based in Milan. “We primarily targeted young Armenians. When you try to enhance interest in culture, you should really start from education, which generally involves the younger generation. In this sense, I was very much thrilled to see that young students would frequent the various locations that hosted the contemporary art exhibits. We even tried to attract their attention even before the launch of the event by involving students from various educational institutions in the process of the actual creation of works by several artists. We also took advantage of La Francophonie Summit as a platform, with several Presidents, Ambassadors and delegations coming to see the exhibitions,” Lenzi revealed. Another important aspect of ICAE2018 was to make sure that artists who arrived in Armenia would later speak about the country, making the entire thing an international phenomenon. And this is exactly where the organizers realized that the exhibition was a success. Once returning to their countries, the artists already wanted to come back to Armenia. According to Lenzi, they had a very nice and positive experience in Armenia and are now helping further promote the country. “When you do a first major event, you have a lot of challenges but we managed to promote ICAE2018 on different platforms and through different channels,” Lenzi said, adding that a carefully-planned post-production will shed more light on the exhibition and the contemporary art scene in general. The exhibition did not seek to monetize art though. However, using art and cultural events you can definitely arouse the economic interest and help boost tourism. Lenzi said they are now exploring the possible ways for finding a permanent location for some of the artworks, especially given that certain artists are willing to leave them in Armenia. “We are now trying to find a way to work with HayArt, and if we reach an agreement with the municipality, we will manage to keep several of the artworks in Armenia,” he said. HayArt cultural center, by the way, was one of the seven locations that hosted the pieces of contemporary art throughout the exhibition. The very special institution located in the heart of Yerevan had been abandoned for many years, and Shaula International took a leap in the dark and decided to renovate the space with the support of Suardi Armenian branch. Besides HayArt, the Armenian Center for Contemporary Experimental Art, Aram Khachaturian House- Museum, Cafesjian Center for the Arts, the Artists Union of Armenia, A. Spendiaryan Opera and Ballet National Academic Theater and the Armenian General Benevolent Union also hosted ICAE2018. “I know from my experience that people like to be out here, I see crowds in the streets, not in cafes or busy with their phones. If we are able to make contemporary art more interesting and engaging, or digitalize museums - as we had one such idea but dropped it as it’s too early - and employ advanced solutions, we could lure more people out of their homes,” the ICAE2018 co-founder says. Defined as unprecedented by artists and art fanciers alike, the ICAE2018 deserves a comeback. And a big one. So let’s wait and see.